Sweaters are one of the more complicated knitting patterns but they can be quiet rewarding. 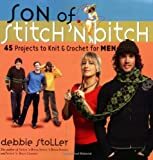 These men's sweater patterns are all pullover style and vary in difficulty from simple stitch patterns for beginners to complex cable patterns. Beginner. A simple pullover, good for beginners. Beginner/Intermediate. Basic knit/purl stitch patterns in a pullover.